One of the dishes served at Nolan’s second birthday party was baked veggie fries, which were easily the crowd favorite of the evening. 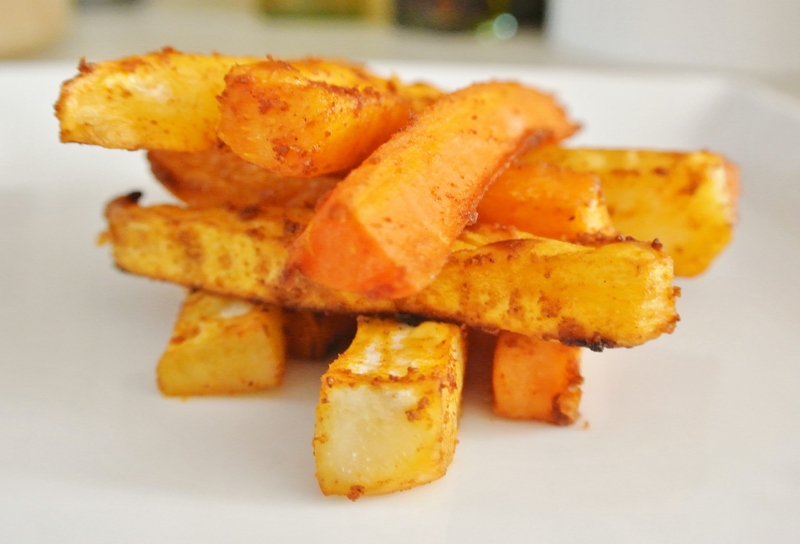 Today, I’m going to share with you how I make these delicious, un-fried fries. The key to a baked fry that can stand up to shuffling on the pan, toddler squeezing, and condiment dipping is using hearty root vegetables. When we think of fries, our minds usually turn to good ‘ole russet potatoes. Nothing wrong with those guys, but fries can really be made out of nearly any root vegetable, be it parsnips, turnips, potatoes, carrots, radishes, etc. 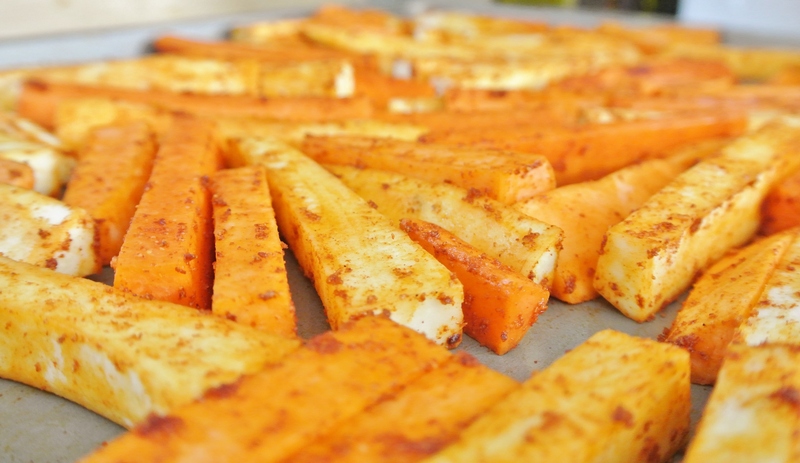 These un-fried fries are sure to please adults, but are the ideal healthy snack for toddlers. Extremely low in oil and salt free (unless you can resist a little sprinkle of pink Himalayan sea salt), they are a snack that I never refuse little Nolan. They are so yummy, I doubt you’ll need a dip, but if you do, try to stay away from processed ketchup, as it is often composed of highly fructose corn syrup and other unnatural additives. 🙂 Enjoy! 2-2 ¼ lbs root vegetables –> I’m using just over two pounds of garnet yams, sweet potatoes, and carrots. 1 tbsp oil (+ 1 tsp for greasing your baking sheet) –> I’m using extra virgin olive oil (I’m a big fan of coconut oil, but love the flavor of olive in this case). Spices and/or fresh herbs to taste –> I’m using 1 tsp each of paprika and garlic powder (no salt). Preheat your oven to 400 degrees. 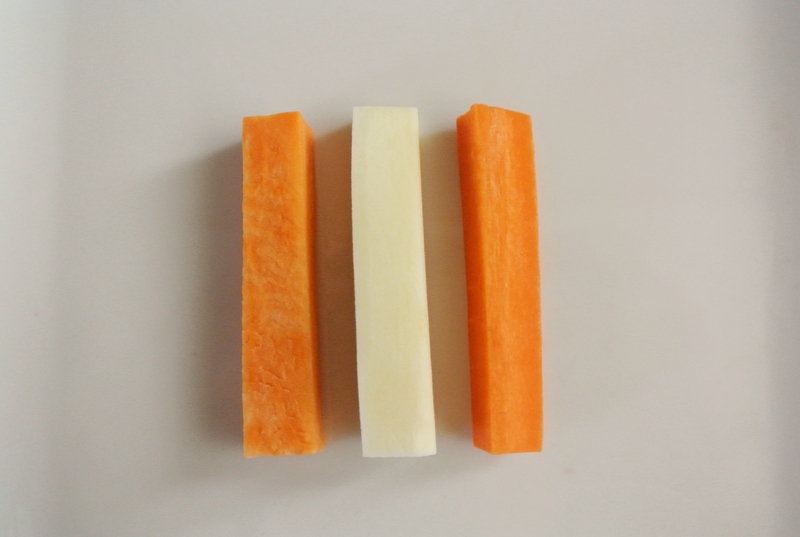 Thoroughly wash and peel your root vegetables. (You can leave the peels on, but I like to save them for homemade veggie stock.) Cut into ¼ inch thick fries. 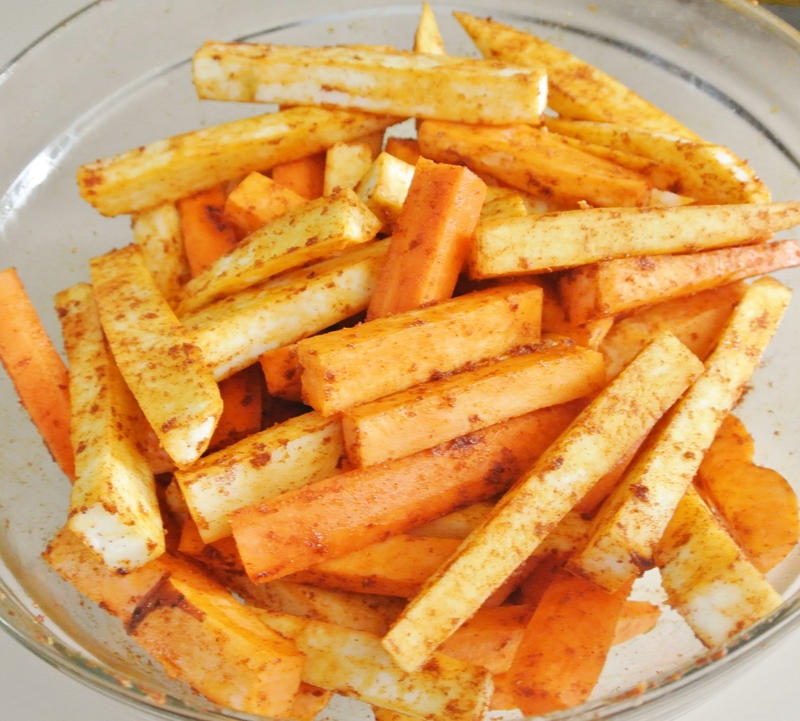 In a large bowl, use tongs to toss the fries with your spices and oil. Grease a baking sheet and spread the fries out in a single layer. Bake for 20 minutes, turning halfway through. Turn the oven off and broil on high for an additional 2-3 minutes for a bit of crispiness. Store in the fridge for up to five days, reheating in the toaster oven if necessary.